Fabric: Cotton Silk, 100% Pure Cotton. - Bengal Traditional Tant Cotton Saree made by the fine quality colorful cotton thread. - Available without blouse piece. - Many colors are available. We are offering a wide range of pure cotton tant sarees, which are as appealing in their design as they are in their body comfort properties. In order to meet huge market demands, we are involved in offering huge assortment of Pink Embroidered Tant Saree. Customers can avail this Pink Embroidered Tant Saree form us at market leading prices. Further, we ensure to provide unmatchable quality of Pink Embroidered Tant Saree to customers. 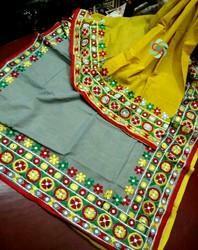 Offered Tant Cotton Saree are extremely comfortable and are quality assured. We offer to our client superior quality Bengali Tant Sarees. 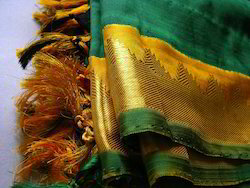 While making these sarees, we make use of high grade raw material and latest technology. This collection combines the beneficial qualities of tant and silk saris and hence we have named our collection as tant silk saris. Rupsayar offers a wide collection of sarees for all its female customers. We offer our customers sarees that are known for their unique fabrics and designs. Each saree is unique add adds glory to womanhood. Our collection of sarees have been well appreciated by our customers. The offered range of Latest Tant Sarees provide trendy look and further can easily be worn during summer and winter seasons. Owing to its intricate designs and color combination, our entire range is highly demanded by our customers.